Earth is the only place in the universe where we know for sure that life exists. Those biologists who study life elsewhere (exobiologists or astrobiologists) have rather little to go on. The only other body in the universe that humans have visited, and from which samples have been returned to Earth, is our moon - which turned out to be a barren place as far as life is concerned. Astrobiologists have had to rely on understand ing the conditions that have made life possible on Earth and then trying to determine whether such conditions exist elsewhere in our solar system and the universe in general. This is an area for endless, but entertaining, speculation and controversy. Whether extraterrestrial life exists is an important question, however, and proof of even very simple life elsewhere would have a tremendous impact on our understanding of our place in the universe. The present revival in interest in astrobiology has been fuelled by our increased understanding of the range of conditions under which life exists on Earth, observations on the planets and their moons in our solar system made by space probes, and improvements in the instruments and techniques available to astronomers. This renewed interest has been recognised by the National Aeronautics and Space Aministration (NASA) by the establishment of its Astrobiology Institute. This is coordinated by the Ames Research Centre in Mountain View, California but is conceived of as a 'Virtual Institute' using the Internet to link a variety of researchers from around the world. The significance of extreme organisms has been recognised by NASA by its involvement in the 'Life in Extreme Environments' programme (LExEn) of the US National Science Foundation. Until the 1960s, speculation on the possibility of life on other planets was confined to those based on earthbound observations. It is easy to forget how short the period of space exploration has been. The first satellite (Sputnik) was launched in 1957, the first manned space flight was in 1961 (by the Soviet Yuri Gagarin) and the first landing by humans on the Moon in 1969 (by the Americans Neil Armstrong and Edwin 'Buzz' Aldrin). The first probe to Venus was sent by the USA in 1962, followed by a series of Russian and American probes. Probes to Mars started in the late 1960s and have continued ever since. In the early 1980s, the US Voyager 1 and 2 probes sent back spectacular pictures of Jupiter and Saturn, and their moons, and of Uranus and Neptune. The pictures, maps and measurements taken by these space probes provide the basis for much of our present speculation concerning the possibilities for life in our solar system. We are visited by extraterrestrial objects (in the form of meteorites, if not UFOs!) and our ability to make observations from Earth (or near it) has improved with advances in the technology available to astronomers - particularly with the launch of the Hubble Space Telescope in 1990. Our understanding of life, its possible origins on Earth and the range of conditions under which it can exist have increased enormously in the past 50 years. What does our knowledge of extreme organisms tell us about the possibilities for life in our solar system and elsewhere? I will just look at what are thought to be, or were once thought to be, the most likely candidates for extraterrestrial life. Venus was once thought to be Earth's twin and people imagined a world of dense forests hiding below the atmosphere which obscures its surface. However, measurements by space probes have shown it to be an evil twin. Its atmosphere is about 100 times thicker than that of Earth and consists mainly of carbon dioxide. This has created a runaway greenhouse effect, trapping heat and producing average surface temperatures around 480 °C. Even at the poles or on high mountains, it is difficult to imagine life surviving such high temperatures which far exceed the capabilities of hyperthermophiles on Earth. Temperatures high in the atmosphere would be lower and some have suggested that organisms may exist which spend all their time floating in the clouds. Apart from staying permanently airborne, these would have to cope with very acidic conditions due to the sulphur dioxide which is injected into the atmosphere by volcanic activity at the surface. Mars has long been our favourite place to imagine life elsewhere in our solar system and, despite us now recognising it to be a cold dry desert, it remains the most likely place to find evidence of past or present life. It is also the planet for which we presently have the most concrete evidence on which to base our speculations on the presence or absence of life. In 1877, the Italian astronomer Giovanni Schiaparelli described what appeared to be straight lines on Mars, which he called 'canali' (channels). This was erroneously translated as 'canals' and led to intense speculation regarding their construction by a civilisation on Mars. The American astronomer Percival Lowell was a leading proponent of the idea that they were strips of vegetation bordering a system of irrigation canals designed to carry water from the poles. This no doubt inspired HG Wells to write the War of the Worlds (1898), in which he imagined the invasion of Earth by creatures from Mars, and in turn David Bowie's 1972 rock album The Rise and Fall of Ziggy Stardust and the Spiders from Mars. 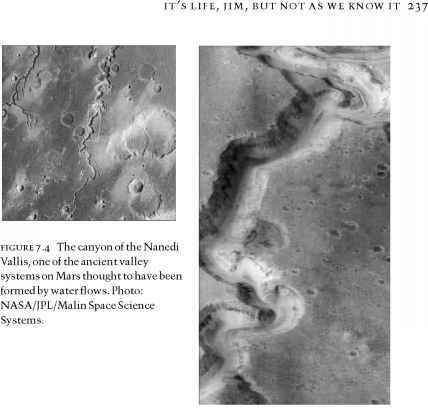 However, pictures of the surface of Mars from the Mariner 6 and 7 space probes in 1969 revealed no such canals, the appearance of which from Earth is now thought to be due to chance alignments of geological features. There have been other apparent false alarms in our search for life on Mars. In 1975, Viking 1 and 2 released landers which arrived at the surface of Mars. The landers contained several instrument packages which sent information back to Earth, including biological experiments designed to look for life in the Martian soil. A scoop from the lander took a sample of soil which was distributed to the biology experiments. The first was a carbon assimilation experiment. Photosynthetic organisms on Earth absorb carbon dioxide from the atmosphere and process (assimilate) it into organic material using the energy of sunlight. Chemotrophic organisms can achieve comparable tricks using the energy from chemical oxidations. This experiment was designed to test for similar organisms on Mars. The Martian soil was exposed to carbon dioxide (and carbon monoxide) gas which had been brought from Earth and which was labelled with 14C, the radioactive isotope of carbon. Any organic compounds formed from assimilation by Martian organisms would incorporate the 14C and be labelled by it. The sample was then heated to break down any organic molecules, which would release the 14C in the form of labelled carbon dioxide. This was measured by detectors which counted the radioactivity released by 14C. You can imagine the excitement of the scientists when the first results of this experiment showed exactly what you would expect if the Martian soil contained active organisms. Heating the sample to 175 °C, however, reduced the activity, although it did not destroy it altogether. Destruction of any organisms by the heat should have stopped the assimilation of carbon. Even hyperthermophiles would not be expected to survive such high temperatures. It is, however, conceivable that cryptobiotes could survive if they were exposed to high temperatures in a desiccated state. This first experiment was designed to look for autotrophic organisms which could fix carbon dioxide by using energy from non-organic sources. The second experiment was designed to look for heterotrophic organisms which use organic material as a source of raw materials and energy (usually by eating other organisms). The labelled-release experiment exposed the Martian soil to organic nutrients that had been labelled with radioactive isotopes. Any gases given off as a result of metabolic activity would also be labelled by these isotopes and could be detected. Again, the signal observed from this experiment was exactly what would be expected if organisms were present in the soil. Heating the sample to 160 °C destroyed the activity, which is also what you would expect if it was due to organisms. The third experiment was a gas exchange experiment which detected the production of oxygen after the soil was exposed to a solution of nutrients. However, oxygen continued to be produced in the dark and after heating the sample to 145 °C - which is not what you would expect if the production of oxygen was due to biological activity (plants need light and any organisms would be destroyed by the heat). The final relevant experiment was a gas chromatography/mass spectrometry package which should have been capable of detecting any organic compounds in the soil. This failed to detect any. This equipment is so sensitive that the scientists concluded that not only was there no organic material present but that there must be some mechanism present which actively destroys organic compounds -some input of organic compounds to Mars from meteorites and comets would be expected. The results of the Viking experiments gave some mixed messages as far as the presence of life was concerned. The metabolic experiments gave the results expected if organisms were present but it is hard to accept that life was present given the failure to detect organic compounds. The results of some of the control experiments (heating the samples to destroy any organisms) are also hard to reconcile with the presence of life. The consensus interpretation of these Viking experiments is that the results are due to some unusual chemical properties of Martian soil and do not indicate the presence of life. There are, however, some who believe that the results are consistent with, and are best interpreted as indicating, the presence of life. 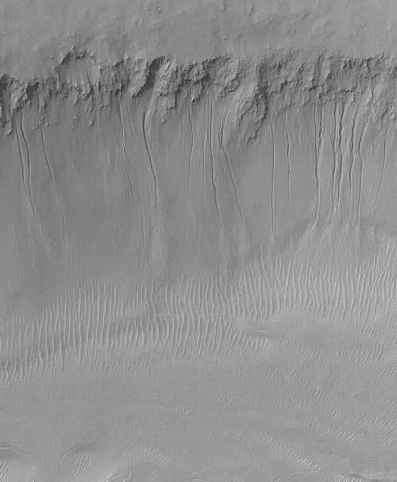 figure 7.3 Small gullies on the walls of the Nirgal Vallis, an ancient valley system on Mars. Mars Orbital Camera images from the Mars Global Surveyor show more than 14 of these channels, which are about 1 kilometre long and run down the south-facing slope of the Nirgal Vallis. The lack of impact craters suggests that the channels are relatively young (anything from a few million years old to just a few weeks or days). They are thought to have been formed by groundwater seepage. This is the only site where these types of features have been observed closer to the equator of Mars than 30° latitude. Other sites are closer to the poles. Photo: NASA/JPL/Malin Space Science Systems. cliffs in craters or valley walls. It is suggested that they are formed by water building up behind an ice dam, with the water being supplied by seepage from a source beneath the surface. The ice dam eventually breaks, sending a flood of water down the gully. The features are thought to have formed relatively recently, and there may even be active water flows today. The morphology of these structures is similar to that formed by water flows on Earth. However, it is possible that they are formed by some other liquid, such as liquid carbon dioxide. There is also evidence that conditions on Mars were not always as inhospitable as they seem today and that it was once a warmer and wetter world. There are flood planes, sedimentary rocks, river valleys and erosional features that indicate the presence of abundant liquid water at some stage in Mars' history (Figure 7.4). Conditions could have once been much more conducive to life and its evolution. Maybe there are survivors that have adapted to the cold dry conditions of today. They could persist in rare favourable sites and, like cryptobiotic organisms on Earth, lie dormant waiting for conditions under which they can grow and reproduce. There may be fossil evidence of life from an earlier, more clement period. Some believe that such Martian fossils have already been found. In 1996, a team headed by David McKay of NASA's Johnson Space Centre in Texas and Richard Zare of Stanford University announced that they had found evidence of fossil life in a Martian meteorite. The meteorite had been collected in Antarctica in 1984. Its reference number is ALH84001: ALH from its place of collection (Allan Hills, Antarctica), 84 is the year of collection (1984) and 001 the sample number. The Antarctic plateau is a good place to find meteorites since they are easy to spot in an otherwise featureless expanse of snow and ice. Ice flowing up against mountain ranges tends to concentrate the location of meteorites in this area. ALH84001 was originally classified as a diogenite meteorite - meaning that it was thought to be one of a group of meteorites that are considered to have originated from the asteroid belt. It was not until some 10 years later that it was recognised as belonging to that rare group of meteorites which originate from Mars. Of about 20000 meteorites that have been collected, only 15 have been identified as being of Martian origin. They are thought to be the result of the impact of asteroids with Mars which ejected rocks from the planet into space and which have wandered the solar system before landing on Earth. It has been estimated that about half a ton of Martian material lands on Earth each year, but most of it, of course, goes uncollected. Scientists can identify these meteorites as coming from Mars because, in some, the composition of gases trapped within them matches that of the Martian atmosphere as measured by the Viking missions. 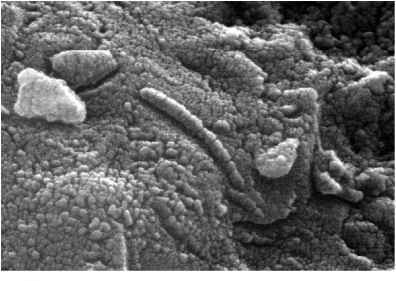 figure 7.5 Possible fossil life found in the Martian meteorite ALH84001. These structures are much smaller than bacteria, only 20-100 nanometres long (a nanometre is one-billionth of a metre). Photo: NASA. 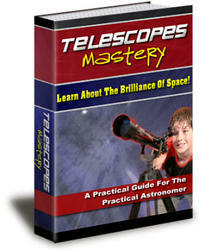 indicate the presence and involvement of water in the present structure of the meteorite. Of particular interest are carbonate globules which are distributed throughout the meteorite. These show a distinct layering around their edges, with alternating layers of magnesium-, iron- and calcium-rich carbonates. On Earth, this type of layering is produced where the precipitation of minerals is assisted by the activity of bacteria. Small grains of magnetite (Fe3O4) and iron sulphide are associated with the iron-rich carbonates. These minerals do not usually occur together, except where the activities of certain bacteria result in their simultaneous production. Organic compounds (polycy-clic aromatic hydrocarbons) were detected in concentrations, and in a distribution, that suggest they were not due to contamination from terrestrial sources. Perhaps most intriguing was the presence of bacteria-like objects associated with the carbonate globules which were observed by scanning electron microscopy (Figure 7.5). These are sausage shaped or look like rice grains and have a very similar appearance to terrestrial bacteria. They are, however, much smaller, being about 100 times smaller than most bacteria. Terrestrial fossils of organisms in this size range (nanobes) have been reported, although there is controversy over whether these originated from living organisms. In March 1999, however, Philippa Uwins and a group of researchers from the University of Queensland announced the isolation of living nanobes from sandstone recovered from exploration wells. These look different from the proposed Martian fossils but are in the same size range. Since the announcement of the evidence for possible fossil life in ALH84001, many non-biological explanations have been proposed, and evidence has accumulated which may contradict the biological origin of the structures observed. The controversy is unlikely to be resolved until we are able to send a mission to Mars to recover samples for analysis. Conditions in the Dry Valleys of Antarctica are the closest on Earth to those on Mars and are being used as a test ground for the development of techniques for searching for life on the red planet. Jupiter is the most massive of the planets in our solar system. There are at least 16 satellites or moons orbiting Jupiter, the four largest of which (Io, Europa, Ganymede and Callisto) were discovered by Galileo in 1610. Jupiter is a gas giant with most of its volume being a thick atmosphere consisting mainly of hydrogen and helium. If there is a solid core to the planet, it is thought to comprise a relatively small proportion of its volume. The atmosphere of Jupiter is similar in overall composition to that of the sun. It generates heat not through nuclear reactions but by the continuing contraction of the planet under gravity as it cools. All the elements necessary for life are present in the atmosphere of Jupiter. Water vapour (which could exist as liquid water in the clouds) and some organic compounds (including methane, ethane, acetylene and hydrogen cyanide) have been detected. Conditions in the upper atmosphere are cool enough to allow life to exist. Deeper in the atmosphere, however, life would soon be destroyed by the heat and pressure. As with Venus, it is possible to imagine life forms floating in the upper atmosphere. It is difficult, however, to imagine how such life could have evolved. 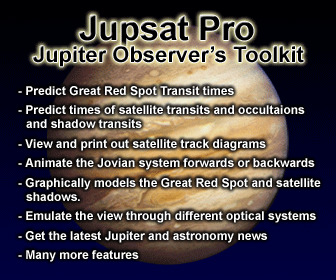 At least one of the moons of Jupiter looks more promising. Some of the moons have a source of heat as a result of tidal heating due to their gravitational interactions with Jupiter and with each other. The orbit of Io around Jupiter is not exactly circular and so, at different times during its orbit, it comes closer to, or further away from, the planet. The gravitational pull of Jupiter on Io thus varies, distorting Io's shape. This gravitational distortion generates friction and thus heat. The tidal heating of Io is sufficient to keep most of its interior molten and there is abundant volcanic activity on the surface. There is no evidence for the presence of water (in any form) on Io and the existence of life is unlikely. The amount of tidal heating on Europa is much smaller than on Io and its surface is cold. 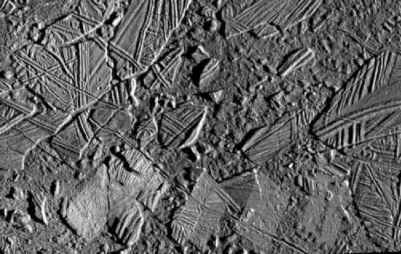 Remarkable images of the surface of Europa were acquired by the Voyager 1 and 2 spacecraft in 1979 and by the Galileo spacecraft in the late 1990s and the year 2000. From a distance, the surface is relatively smooth with few impact craters. This suggests that it has been regularly resurfaced. The absorption of sunlight from the surface of Europa indicates that it consists almost entirely of water ice. There are cracks and patterning, however, that indicate the presence of liquid water beneath the surface and the periodic flow of liquid water at the surface (Figure 7.6). It is possible that Europa is entirely covered by a frozen ocean of water and that there is liquid water beneath its surface. The subsurface water could be maintained as a liquid by the heat generated by tidal heating, from radioactive decay and from the penetration of sunlight. Estimates of the amount of heating generated from these sources vary widely and liquid water could exist at or just beneath the surface of Europa or the ocean could be entirely frozen. figure 7.6 The Conamara Chaos region of Europa indicates relatively recent resurfacing. The irregularly shaped blocks of ice were formed by the movement and break-up of the existing crust. This is a mosaic of images taken by the Galileo spaceprobe in 1997. Photo: courtesy of NASA/JPL/Caltech. exist even if covered by 4 kilometres of ice. Where there is liquid water, there could be life and Europa is the most promising place after Mars to look for extraterrestrial life in our solar system. Part of the interest in Lake Vostok stems from its similarity to the possible situation on Europa and its potential as a model to develop techniques to look for life under these conditions. The most probable source of energy for life on Europa is chemical oxidation with hydrothermal systems, driven by tidal heating, providing liquid water and an energy source. Titan is the largest moon of Saturn and the second largest moon (after Ganymede) in the solar system. It is also the only moon in the solar system known to have a thick atmosphere. The atmosphere consists mainly of nitrogen and methane, together with hydrogen, carbon monoxide and carbon dioxide. Apart from methane, a variety of other organic compounds have been detected including ethane, propane, acetylene, ethylene, hydrogen cyanide, diacetylene, methylacetylene, cyanoacetylene and cyanogen. Water is thought to be present on Titan, but, with a surface temperature of —179 °C, and no volcanic or hydrothermal activity, the presence of liquid water is unlikely. Lakes or oceans consisting of liquid methane and ethane are possible. Life on Titan seems unlikely, but the presence of significant quantities of organic compounds suggests that it could mimic some of the processes that led to the development of life on Earth. A mission to Saturn, the Cassini spacecraft, was launched in 1997. In 2004, it will deploy the Huygens probe which will land on Titan and provide information on the composition of its surface and atmosphere. We know, of course, that life exists on Earth. Life on Mars seems possible, but not on Venus. There appears to be a habitable zone around the sun: with Venus being too close (too hot), Mars perhaps too far (too cold) and Earth just right. Apart from its distance from the sun, the size of a planet and its ability to form and retain an atmosphere will also determine its habitability. If planets occur around other stars in the universe, there could be earth-like planets within their habitable zones. Our understanding of the extreme conditions under which life is possible will affect our estimates of the sizes of habitable zones around stars. The search for planets outside our solar system (extrasolar planets) has mainly relied on their effect on the motion of the star around which they are orbiting. Depending on how you define a planet, the presence of 53 extrasolar planets has been confirmed by July 2000. Using instruments such as the Hubble Space Telescope and the Very Large Array in New Mexico, protoplanetary discs have been observed around a number of young stars, including binary systems. From observations by the Hubble Space Telescope, it is estimated that there are 50 billion galaxies each containing up to thousands of billions of stars. Many of these may have planets around them, some of which will be within the star's habitable zone. Our solar system is unusual in that it involves a single star, whereas most stars are in binary or multiple systems. However, given its size, it seems likely that there is life elsewhere in the universe. Whether we will ever be able to prove its existence is another matter.